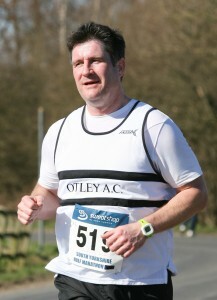 Otley AC is profoundly sad for the loss of our true friend and fellow runner John Cowan, following his short illness. We are all devastated by his loss and offer our condolences and dedicate our support to his family, friends and colleagues and especially to his partner and our friend Laura Hind. He was a true gentle-man in every way and he will always be missed. It’s sad when anyone passes away but when such a young, fellow club runner leaves us so suddenly, it makes it devastating. My thoughts are with Laura and John’s family during this difficult time. Due to work commitments I can’t make it on Sat, but I will be observing a minutes silence at 11am. I became acquainted with John on the club training weekend last October. He struck me as a thoroughly decent and instantly likeable man, which makes his death seem all the more cruel. Whilst I’m injured, I’ll make every effort to walk the handicap and attend the pub afterwards to honour and toast his memory. I just want to say how sorry I am to hear of this, and to pass my condolences on to Laura and John’s family. Thinking of you all. What terrible news, I am devastated , it can not be true, I liked John very much , a beautiful person indeed . Condolances to Laura and to John’s family . John rest in peace. Terribly tragic news. I haven’t been down to the Club much in the last year or so and only had the pleasure of properly chatting with John and Laura for the first time shortly before Christmas. My thoughts are with Laura and her family. Sad days for the Club. So sorry to hear of this sad news. Thinking of you Laura at this difficult time. What can you say? So sorry to hear about John. A lovely, warm & friendly guy. Thoughts with Laura and family. So sad to hear this terrible news, love to all his family. Great turnout today to Celebrate Johns life, and time with the club. We miss him. So sad, Truly John was a great “Black and White” you will be sadly missed John, thoughts are with Laura and all immediate family, rest in peace John. We will miss you John . Some years ago at the the Colin Best’s handicap race , the morning was beautiful with sunshine and frost , it was the day that Gemma H. passed me with double speed, and along the canal on the way back I was really struggling , then it was John that passing me he realize that I was tired and he told me words of encouragement ,to keep going that the finish line was not far away. John went to win the race that day. Well done, you are still with us. I was reading November newsletter and I notice that John ran the Abbey Dash 10k with an impressive time of 47:08 not bad at all , a good performance . You ran well John, bless you. Is that time of the year again for the Ilkley fell race , I used to do this fell race for several years until 2007 with a results of around 80 minutes , it is quite a short one but indeed one of the hardest fell race I ever done ,and looking at last year results I could see the name of John in 185 position with a brilliant time of 65:13, I would say that John had a good ran on the Ilkey Moors with a strong performance , done on difficult terrain. There is a newsletter’s report from Andrew R. from Haworth on the Withins Skyline fell race of the 13 October 2013 , it is a 7 mile that I ran few times in the past, it is usually very muddy and John came to the finish line in 214th with a superb time of 69 minutes and 02 seconds, there is as well pictures of John on that day from the Woodentops and as well a video of 27 minutes of this fell race on Channel|Run on Youtube where John looks running great. Grazie Antonio – ci vuole molto sforzo trovare questi articoli, fatti e video. Ci da molto conforto vedere la sua faccia e gli ricordare facendo le cose che gli hanno dato il più piacere. Dear Laura , mi dispiace molto che il caro John non c’e piu ,e una grave perdita per tutti noi , specialmente per te ,e anche la sua povera familia . Quando incontravo John lui me sorrideva sempre ,e anche mi parlava ,come se io ero un vecchio amico , un bravo ragazzo davvero. To watch the video of John running the fell race with a good stride, on Youtube type ” withins skyline 2013” the video is 27 minutes long , you can see John doing well in this fell race , for the first time at around 4 minutes of the film ,and for the second time at around 24 minutes , he was enjoying the day on the fell with a good performance .